Shariah Finance Watch is a project of the Center for Security Policy‘s program to educate the public and policymakers about the dangers of Shariah. 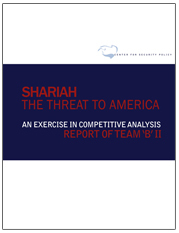 For a more in-depth look at Shariah, see Shariah: The Threat to America, a report by 19 top national security practitioners– including the former Director of Central Intelligence, the former Deputy Undersecretary of Defense for Intelligence, and the former Director of the Defense Intelligence Agency. Shariah: The Threat to America is available on paperback and Kindle at Amazon.com. Below are frequently asked questions about Shariah and Shariah-Compliant Finance, or Islamic Banking. Understanding Shariah law is integral to understanding the dangers of Shariah-compliant finance. Shariah law is Islamic law dating back to the 7th century and is today the law of the land in Saudi Arabia, Iran, Sudan and the law under which the Taliban operates. What are some of the risks of shariah-compliant finance? Terror Financing Mechanism: SCF as monitored by paid Shariah law advisors to U.S. banking institutions must “purify” certain return on investment (ROI) dollars that do not meet Shariah law standards. This money must be donated to Islamic charities – including some that promote Jihad and support suicide bombing. Investment disclosures state that these profits can be as high as 6% of profits of investments. With $800 billion already in SCF assets, the potential for billions of dollars to be siphoned off for terrorism is real. This would be a serious criminal violation of U.S. law. Consider this example: Shariah Mutual Funds promote themselves as “ethical funds.” To be Shariah-compliant, they donate “tainted” revenues to Shariah-compliant “charities.” A post 9-11 U.S. investor in a Shariah-compliant “ethical investment” is not told that Shariah law also requires imposing Shariah as U.S. law, execution of gays and female apartheid. Is he a victim of consumer fraud? Is this same post 9-11 investor unwittingly funding terror? The government has shut down the three largest Shariah-compliant charities in the U.S. – the Holy Land Foundation, Benevolence International Foundation, and the Global Relief Foundation – after proving they funded terrorist organizations.The American taxpayer deserves answers to these questions. The Center for Security Policy (CSP) is meeting directly with members of Congress, U.S. regulatory agencies and Wall Street financial institutions in order to ensure the enforcement of existing U.S. laws on sedition, disclosure, material support of terrorism, and money-laundering. CSP is committed to revealing the civil liability and criminal exposure of Shariah law and Shariah-compliant finance. How is shariah related to jihad? Shariah mandates as a religious obligation, conducting violent jihad against non-Muslims to establish Islam’s rule worldwide in a form known as the caliphate. How does shariah finance relate to shariah itself? Shariah finance is indistinguishable from shariah itself, since its followers consider shariah immutable, indivisible, and mandatory for Muslims to follow in all aspects of life. Muslims are not allowed to pick and choose different aspects of shariah to follow. Anyone that infers that shariah finance is something apart from shariah is simply being dishonest. In fact, the main purpose of shariah finance is to promote shariah. Where is shariah-compliant finance most prominent? According to the November 2007 edition of The Banker, Iran dominates the world of shariah-compliant finance. Three of the five largest shariah-compliant financial institutions in the world—including the top two—are Iranian. The amount of shariah-compliant financial assets in institutions in Iran is over twice as large as the amount in financial institutions in the world’s second largest shariah-compliant country, Saudi Arabia. How does shariah finance threaten Americans? Shariah finance is a threat to Western values, human rights and US national security. Shariah finance has a political objective: to legitimize shariah in the West. Evidence indicates that shariah-compliant finance provides financial support to extremism and terrorism. Shariah-compliant financial institutions employ shariah scholars, many of whom have been shown to be extremists, even to the point of advocating suicide bombing and jihad against America. Among the decisions these scholars make is the donation of 2.5% or more of annual earnings to Muslim charities. Similar to zakat, earnings from investments that are judged to have been unislamic must be purified through donations to charities as well. Given the extremist tendencies of these scholars and the fact that no fewer than 27 charities have been designated as funding terrorism by the US Treasury Department, this presents a hazard which could obviously threaten US national security. In sum, shariah finance represents a number of potential threats to the US, including possible financing of terrorism and extremist Islamist organizations and movements, infiltrating our financial markets and legitimizing shariah. Have shariah-compliant financial institutions been tied to terrorism? There are a number of well-documented cases in which shariah-compliant financial institutions have participated in the financial support of terrorism. For instance, two shariah-compliant banks registered in the Bahamas, Bank Al-Taqwa and Akida Bank, were, according to the US Treasury Department, shell companies actually run out of Italy and Switzerland, whose only real business was laundering money to terrorists. From 1988 until November 2001 when it was designated a terrorist entity by the US government and the UN, Bank Al-Taqwa transferred tens of millions of dollars to HAMAS, Al Qaeda, the PLO, Algerian Armed Islamic Group (GIA), the Taliban, Egyptian Gama’a al Islamiya and the Tunisian An-Nahda. In another case, prominent members of the Saudi royal family were co-investors with Osama Bin Laden in the Sudanese Shamal Islamic Bank while several designated terrorists maintained accounts there. How have shariah-compliant financial institutions used charities to fund terrorist groups? Generally, shariah-compliant financial institutions have provided funds to terrorist and extremist groups through Islamic “charities.” The financial institutions donate the money to the charities which then steer the funds to terrorist groups. For example, both Bank Al-Taqwa and Akida Bank used charities in Europe, the Middle East and the US to funnel money to terrorist groups. Have shariah-compliant financial institutions in the US been tied to terrorism? BMI worked closely with the Bank Al-Taqwa/Akida Bank network in transferring millions of dollars to terrorist groups through them, while receiving large amounts from well-known donors suspected of funding terrorism. These included the Hamas top leader, Mousa Abu Marzouk, who made a number of investments with BMI. Tellingly, BMI continued to work with Marzouk even after the latter was declared an internationally designated terrorist by the United States government in 1995. How widespread is the use of Islamic charities to fund terror? No one in the West knows for sure how widespread the use of Muslim charities for terrorism funding actually is, however, the US Treasury Department has so far designated no fewer than 27 Muslim charities in the US and worldwide as terrorism entities due to their funding of terrorist groups like Al Qaeda, HAMAS and others. We know that there is state sponsorship of terrorism. Is there state sponsorship of shariah finance? State sponsorship of shariah finance has been ongoing since its inception with the founding of the first shariah-compliant bank in 1975, Islamic Development Bank (IDB). In Iran, which has more shariah-compliant institutions than any other nations, all of the banks are in fact state-run. Have shariah-compliant financial institutions been tied to weapons of mass destruction? Yes. Iran’s largest bank, Bank Melli, which was named in the November 2007 edition of The Banker as the largest shariah-compliant bank in the world, has been put under sanctions by both the US government and the European Union for its role in financing Iran’s nuclear and ballistic missile programs. How does shariah finance threaten freedom-loving Muslims in the West? The effect of legitimizing and promoting sharia in the West can already be seen in Western Europe. Promoting shariah incapsulates Muslim communities from mainstream society and even creates enclaves controlled by shariah. Shariah-compliant finance plays a particular role in this because, a devout Muslim living in a Western country in which there are no shariah-compliant banks are allowed to use conventional “infidel” institutions under the sharia doctrine of “extreme necessity.” However, once shariah-compliant institutions do exist, they are religiously obligated to patronize them exclusively. Thus, by allowing the spread of shariah finance in the West and the US, we are pushing Muslims toward shariah. What can our government do to protect our markets from shariah finance? There is much that the government can and should do to regulate sharia finance to ensure that it does not result in the promotion of sharia in the US and the financing of terrorism.